Whew. September was freaking crazy haha. But I'll be honest, September was probably the worst of 2018 when it came to hours worked. Now don't get me wrong – I had a lot of fun too and I'm super grateful for everything. I constantly remind myself that I was a band director just a little over three years ago, so all of this is still pretty surreal for me. The great thing is that all of them went well! But you might be wondering…why all of them in September? Why not spread it out? Well…I'm an idiot. Alright alright, not really. It just happened to be that September was the best month to get all of this stuff out there. I've known for months that it was going to be a little crazy, so none of this was a surprise. Straight-up though – I'm ready to go into chill-mode for the rest of the year. I have loooooved every minute of 2018 so far, but I've gotten to the point where even my blogging friends are telling me that I'm doing too much haha. I guess I'm just wired to work a lot, but I will be making a serious effort to chill for the rest of the year. But first, we need to dig into the craziness of last month! It’s already been so cool to see the progress and how much my life has changed over the past two and a half years! I used to be a high school band director, which was basically what I had wanted to do my entire life. I had $40,000 of student loan debt that I hustled really hard on and paid it off in a year and a half (you can read more about that here). Take a look at my free blog setup tutorial. You’ll have your own blog set up in just 10-15 minutes, and will receive a lower website hosting price since you’re an M$M reader when you use my exclusive link. As a bonus from my family at Bluehost- you’ll also get a domain name for free ($15 value)! So far I’ve had nearly 5,000 people sign up for my blogging course since I created it, and the reviews have been great! Even if you are just thinking about starting a blog or want to figure out how to get more traffic to the one you already have, this will be useful for you. Such an awesome month for course sales. I never ever ever ever ever would have thought that I'd be here with the business after just a few years. My favorite thing about focusing on course sales as my main source of revenue as M$M grows is that it's something I have a lot of control over. Affiliate income is awesome and I'll be focusing heavily on growing that for M$M and LE in the next year, but you're kinda at the mercy of whatever the company you are partnered with does. If they decide to get rid of their affiliate program or cut their commissions in half…what can you do? My goal has been to get the course thing figured out, and then build up my other income streams. I don't know if that's the “right” way to do it, but it's definitely the business model I feel the most comfortable with. Now that we have some proven products, we're going to focus on scaling, optimizing sales funnels, and diversifying. I hope I can stick to this haha. “How many modules are in the course? Currently, we have 9-course modules. They walk you through the entire process of running FB ads, getting clients, and even the nitty-gritty stuff like invoicing clients. We also add a tooooon of content in the private group for the private group attached to the course. We regularly do coaching calls, hot seats, and live training every week (Wednesdays at 7:00 pm CDT currently) to make sure that our students are staying on track. The course is currently closed for enrollment, but you can jump on the waitlist here to get access when we re-launch. 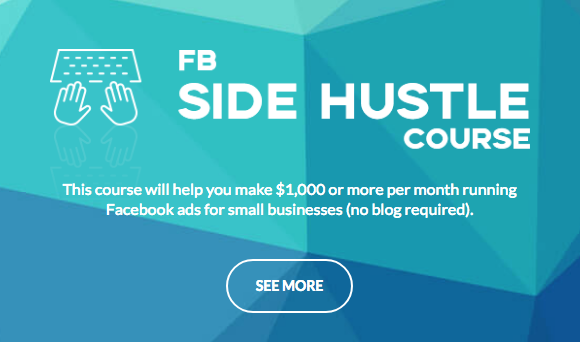 If you've been thinking about making extra money to pay off debt or invest a little more every month, the FB Side Hustle Course is definitely for you. The FB Ads for Bloggers course launch was awesome! I'm so glad we finally got this bad boy rolled out. We actually ended up launching it while I was on vacation in Florida, which was a horrific idea. Never again haha. When it was all said and done, we did $16,320.00 in revenue (included in the amount above) during the sale. We have been selling a smaller version of this course all year (formerly called Blow Up Your Blog), so everyone that already had the old course got all of the new content for free! We always give our students lifetime access to our courses and free upgrades, but this one was by far the biggest upgrade we have done, expanding the content by about 5-6x. I know that a lot of people were expecting this to be a huge six-figure launch like we have done several times with the FBSH course in 2018, and may be surprised by that revenue number, but we knew ahead of time that it was never going to be that large because we only launched it to a smaller segment of my audience. My blogging email list is a fraction of the size of my “normal” email list (20k+ subscribers) with only about 4,000 people on it, so there wasn't any way we could have done a similar volume in terms of revenue. We chose to only launch to this smaller segment of the list because the offer really wasn’t relevant to most of my audience, but now that we have proved the funnel we can focus on growing the blogging audience and getting this course in front of more bloggers. Knowing that we were launching to a smaller audience, we judged the launches performance based on the funnel’s performance. Whenever we do a launch we pay close attention to the traffic and conversion rates at each step in the funnel to see how it does and where we have room to improve. The FB4B’s funnel knocked it out of the park. The goal was to see if the sales page and cart converted at the percentage that we hoped they would…and they did. To give you a little peek at the numbers, over 25% of the people who hit the order form ended up purchasing the course for $297. On top of that, 50% of the buyers went on to get the $37 order bump offer and 20% bought the $147 Advanced Facebook For Bloggers course as an upsell. If you're a numbers person…you know those conversion percentages for the course and upsell are ridiculous. To put this in perspective, we have done multiple 6-figure client launches where the order page converted as low as 3% and no higher than 10%, so this launch really validated that we were getting things right with both our offer and copy. In fact, FB4B actually converted at a slightly higher rate than FBSH during the launch, which is really exciting. Now we just need to scale the traffic to that course via paid, organic, and referral traffic. Speaking of – the affiliate program will go live soon! If you've already taken the course, be on the lookout for an email from me. We're going to make this thing very profitable for our affiliates and even have some surprises for you! A lot of people don't realize this about course launches, but a big part of the process is testing the product to see if it's a good offer worth pursuing. You never quiiiite know if something is going to work out, and sometimes you may have to ditch a product because the demand isn’t there, or completely rework it if the messaging is off. We made some of those changes by rebranding and expanding the content of version 1.0 of the course. But now that we know FB4B is viable and heard such great feedback from people about it at FinCon, we'll spend more time getting it in front of potential customers. The other positive – and this is HUGE – is that we've already seen a bunch of bloggers that have taken the course experience increases in affiliate sales, traffic, email subs, and overall revenue after applying the FB ad strategies that I've been using for years now to grow M$M. Our student Miranda is a great example of this. In September she spent $80 on Facebook ads (less than $3 per day) and she made back $380 in affiliate sales from the campaign. 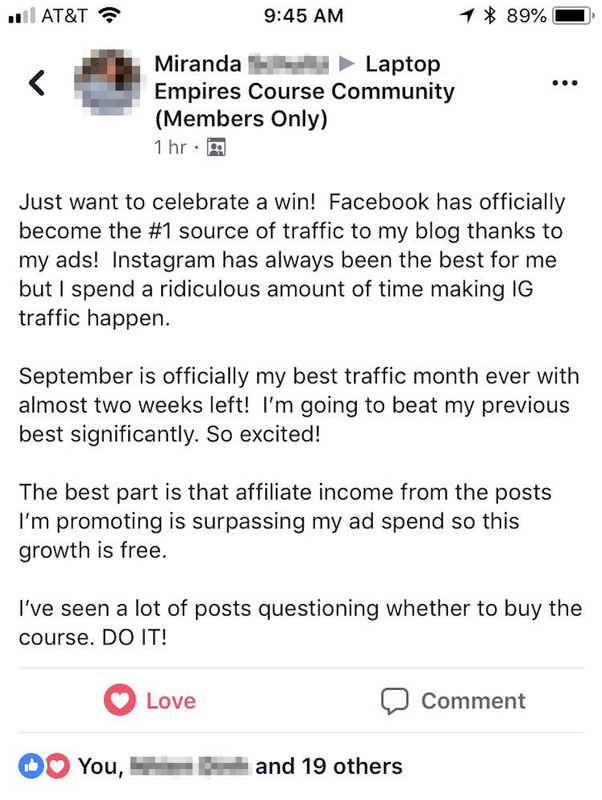 This was her first time running Facebook ads for her blog, and now it’s her number one traffic source and is giving her a great ROAS (return on ad spend). The best part is she is reinvesting that profit back into her ads this month like a savvy entrepreneur. Paying for traffic is definitely against the norm in the blogging community, but as Pinterest moves away from organic traffic and Google continues to become more sophisticated, we know that this is a great way to grow your blog quickly. I mean honestly…FB ads are how I grew this blog so quickly. They just work, and you can run traffic campaigns for as little as $1 per day. Then, once you have your traffic coming in consistently from FB, you can continue working on SEO and Pinterest. Ultimately, you want to go after as many traffic sources as you can to protect yourself against algorithm updates or organic reach throttling. That's what FB ads for Bloggers is all about. It's like an insurance policy and quick growth strategy wrapped up into one magical unicorn blogging burrito. You’ll also get our Blueprint for quick blog growth so you know exactly where to spend your time and resources to get the best results. (this is huge if you want to grow and scale on a limited budget). We're also including a free month of our FB ad coaching group, which includes campaign troubleshooting, blog coaching sessions with me, access to our entire team of paid FB experts, weekly live training, hot seats, and more. This was my first ever mastermind (which is cool, because I never really imagined that people would pay me to help them grow their blogs). Grant and I discussed this all the way back in January, and finally had an opportunity to put everything together and help bloggers learn how to scale their sites and produce full-time income. We're only two sessions in, but we're already really excited about the growth from this initial group of bloggers. Honestly, we're not sure if we're ever going to do this again. It's not that we don't want to – but Grant and I are both crazy busy with new businesses, life changes, and he's about to release a book next year and do a world tour promoting it. The information we're sharing is pretty crazy though! This stuff would have blown my mind just a year or two ago. It's amazing how quickly blogging moves and how many different pathways you can take to become successful online. Ah yes, another one of my side hustles. 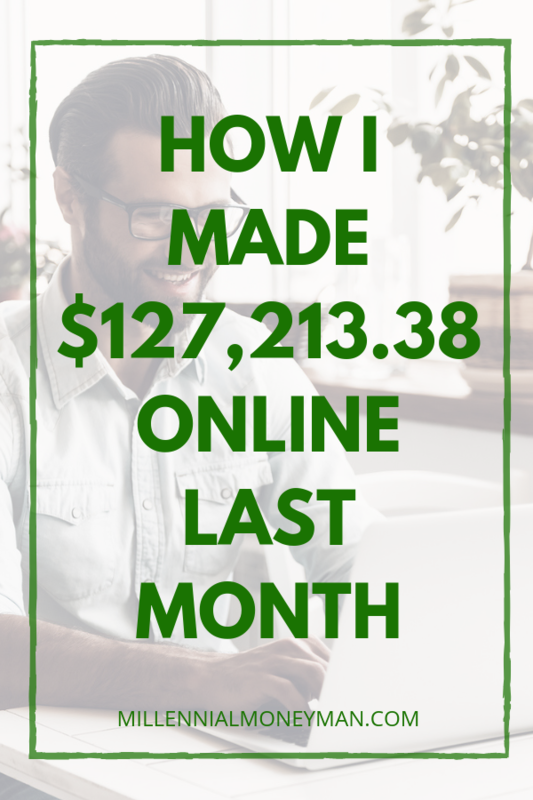 It's so crazy – this used to be my largest online income stream! Back in the early days of M$M, I didn't make any money. I literally had to take on digital marketing work to survive. Fortunately, I put as much of that money back into my business as I could by paying for FB traffic, better web design, and courses. Now…this is not my largest income stream anymore haha. But it's great to have consistent revenue, and my team handles a lot of the work for me. I just jump in here and there to put out fires and make sure that the quality of the work is good. Ahhhh I'm so excited. I have one more project coming out in November that will *probably* have a direct and significant impact on my affiliate income. It's actually like mad-scientist level stuff, so I'm very excited to do this thing that I can't tell you about yet. It might take a little bit for everyone to realize what is going on and how I'm doing it, but I guarantee other bloggers in the personal finance space will copy this (again…assuming it works). Other than that, affiliate income was about the same as it has been for the past several months on M$M. Kinda meh but I'll take it. The cool thing is that all the courses are rolling, so most of my focus will be affiliate income and traffic in 2019. Still going with my staff writing side hustle! I'm not sure if they are going to keep me around or not, but I sure hope so haha. It has been a little tough for me to stick to a consistent timeline creating articles for this organization, but so far they seem happy with me. I think one of the reasons they like working for me is that I don't write…conventionally. AKA my grammar is poor but I keep it conversational and fun when I write about money. Occasionally, Mike and I will help other bloggers with their Facebook retargeting ads on their course launches. As much as we like doing this, this latest one will probably end up being the last time we provide this service. We're really trying to cut back on work that we do for other people so that we can do more for ourselves. Hmmm…ads. I don't really like them too much, and now that I've taken the majority of them off of M$M, I don't make nearly as much revenue (proportionate to everything else) as I used to. I either need to scrap ads altogether, stick with Adthrive and turn more ads back on, or jump over to Mediavine and see how the RPMs are there. For some reason, I'm having a hard time with this decision. Fortunately, it's not really make or break for the business right now, so I can afford to keep procrastinating. As far as traffic goes, September was probably the lowest you'll ever see it again. I had several of my FB traffic campaigns get long in the tooth, which means that the cost goes up and you get less clicks for the amount of budget you spend. The goal for the rest of this year and 2019 is to grow traffic significantly, and that's pretty much it. I haven't focused on traffic growth at all in 9 months with all of the courses and funnels we've been creating, so we'll see what happens when I turn my OCD towards getting more people on the site. One advantage I have is that I'm literally willing to outwork and/or outspend anyone I know when it comes to building my business. Outside of my wife getting whatever nice stuff she wants, I will put every dime I have back into my business if I feel that it will help me out-compete everyone. I will also start working at 7:00 am and work until midnight every day of the week for the next 5 years straight if needed. I don't have a lot of the romantic notions of retiring early or creating the perfect work/life balance that many of my blogging friends do. I'm trying to build a business quickly while I'm young. That's pretty much it. Is that healthy? Eh. Probably not haha. This number includes the costs associated to pay my team, run FB ads, and all of the fun stuff like Convertkit, blog hosting, Teachable, and images. I also had some costs for the money mastermind, such as a Thrivecart one-time fee and Facebook ad retargeting ad spend. For the purposes of this report, I'm going to split the net revenue of the Facebook course and FB4B in half. Mike and I leave money in the business (which is structured as an LLC that is owned by our LLCs). It produces a K-1 every year and then we just transfer the revenue to our main business accounts. The Mastermind with Grant is set up in a similar structure, and I split the net revenue in half and subtracted my expenses for that project. Now that we have our courses developed and have a solid support group for both of them…it's time to re-focus a bit. I've been so caught up in course creation and keeping up with the growth of the business that I've really neglected a lot of things with M$M. I have so many older posts that need to be updated, so many opportunities for bringing in new traffic, tons of things to work on for SEO, and last but certainly not least – a lot of readers that I want to connect with on a more personal basis. So for the rest of this year and into 2019, I'll be really dialed in on growing traffic on this site, growing traffic for Laptop Empires, growing affiliate income, and interacting like crazy in all of my online communities. The first three quarters of 2018 have felt like a never-ending sprint. I'm actually excited to get into marathon mode haha. We hired a writing team for Laptop Empires! Isn't that crazy? Originally, I was going to create a lot of the blog posts for LE. But then once Mike and I started looking at everything on our plates…we decided to bring in writers. What I'm finding more and more is that I can't just say yes to everything anymore. I mean if you just look at these income reports, you'll see that I have a mountain of stuff going on every single month. A lot of my blogging friends think I'm a crazy person. There's some truth to that, and I don't plan on slowing down any time soon…but I need to be a smarter/more efficient crazy person moving forward. So we're going to start pumping out a ton of awesome online business content over at Laptop Empires, and I'm going to focus on content creation for M$M. Coral and I are going to Italy soon! I am going to drink all of the wine and eat all of the pizza. So excited. I've actually never been to Europe before, so this will be a pretty cool trip for us. We tend to go to “beachy” places for vacations, but the United Emirates was running this crazy flash sale back in February that we couldn't pass up. For two round-trip tickets to Italy, it cost about $750. TOTAL. It was just too hard to say no to that. So we'll be going to Rome, Venice, Florence, and a day trip to Tuscany while were in Italy. Out of everything there is to do, I'm most excited about seeing the churches. They just look so incredible! Did I mention that I'll be drinking wine? I looooove doing Instagram stories, so I'll be documenting a lot of our trip there. If you've been reading M$M for a while – I honestly can't thank you enough. Hopefully, you can tell that I work really, really hard to produce content that makes your life better. It's my passion in life. But, I can't do any of this without you. I hope you had a great month in September! Make sure you jump into the private M$M group on FB so we can hang out together! I'm in there allll the time haha. What is your main traffic source for your blog? I really appreciate you sharing those earnings reports. They keep me inspired and make me shoot for the stars. Thank you! P.S. Love you podcasts on Laptop Empires. They deserve way more listeners than they have now. Traffic will sky rocket one day I’m sure. Keep it up! Thanks so much! Yeah this year has been so much work on developing courses and funnels, but it’s been a good one for sure. We’ll be driving a lot more traffic to LE moving forward – so glad you like the podcast! Wow, this is amazing and so inspiring Bobby! And if you need any tips on what to do and where to eat in Rome, Venice and Florence I can definitely help with that! They are all amazing cities, but having returned to Venice in June after 15 years, I have to say it’s spectacular! Pizza. I need pizza spots haha! There were a toooooon of churches! We did really enjoy the trip, and had a bunch of Gelato! Kinda Late to the comment train but whatever 🙂 I have been following you for over a year now. Seriously have changed my life with a lot of the money handling and business skills! I wanna be the girl version of Bobby when I grow up! M$W isn’t as cool though HAHA! Keep it up!